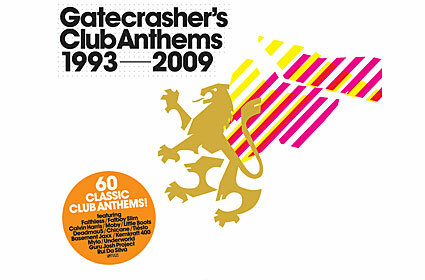 Gatecrasher Club Anthems 1993-2009 is the new 3 CD package celebrating some of the biggest tracks to rock the dance floors of the Gatecrasher club empire. The new album is all about the energy, passion, and irresistable momentum of one of the most famous clubbing brands in the world. CD1 features classics such as Rui De Silva - Touch Me with current favourites like Paul van Dyk - Home and Tiesto - I Will Be Here. CD2 includes such anthems as Sneaker Pimps - Spin Spin Sugar, Tori Amos - Professional Widow, and Arman van Helden - You Don't Know Me. CD3 ranges from Grace - Not Over Yet to Mylo - Drop The Pressure via Mory Kante - Yeke Yeke and Moby - Go. Moby will be headlining the official launch party of the album at Gatecrasher's flagship club in Birmingham on Saturday 14 November. Gatecrasher's Club Anthems 1993-2009 provides the perfect opportunity to look back at the club's heritage while hinting at the future direction and evolution of the brand.